Blood pressure is the pressure that the blood exerts against the walls of the arteries as it passes through them. Pulse refers to the periodic ejection of blood from the heart's left ventricle into the aorta. The left ventricle, or chamber, receives blood from the left atrium, another of the heart's chambers. By contracting, the left ventricle drives the blood into the aorta, a central artery through which blood is relayed into the arteries of all limbs and organs except the lungs. Pulse, transmitted though the arteries as a repeated pressure wave, is the mechanism that moves blood through the body. The high and low points of this pressure wave are measured with the sphygmomanometer, or blood pressure monitor, and are expressed numerically in millimeters of mercury. The higher number, systolic pressure, measures the maximum pressure exerted on arteries and the heart muscle; the lower figure, diastolic pressure, measures the minimum pressure exerted. The reading of the two measurements indicates how hard the human system is working. All physicians consider a patient's blood pressure when determining general health or diagnosing disease. The blood pressure monitor is used in conjunction with a stethoscope. After fastening the constricting band, or cuff, around one of the patient's arms above the elbow, the clinician inflates the cuff by pumping air into it with a rubber squeeze bulb until the mercury column or the needle of the gauge (also known as an aneroid dial) stops moving, usually at a point between 150 and 200 millimeters of mercury. The stethoscope is then placed over the brachial artery, on the inside of the arm at the elbow, while air is slowly released from the system via a small valve attached to the bulb. The technician watches carefully as the air escapes and the pressure indicator correspondingly declines. The point on the gauge at which the pulse can first be heard through the stethoscope indicates systolic pressure, and the gauge's reading when the sound disappears indicates diastolic pressure. Normal pressures vary with the individual, but systolic pressure typically ranges between 110 and 140, while diastolic runs from 65 to 80. Pressure above normal levels predisposes the patient to such health problems as heart disease, stroke, and kidney failure. Many early attempts at measuring blood pressure involved attaching an instrument directly to one of the patient's arteries, a painful and dangerous practice. The first sphygmomanometer to use an inflated armband was developed in 1876 by Samuel Siegfried von Basch. Twenty years later, the Italian physician Scipione Riva-Rocci developed a more accurate device that soon replaced von Basch's instrument. Riva-Rocci's design was much like today's monitor, but its operating procedure allowed for measuring blood pressure only while the heart was contracted. In 1905, the measurement procedure was further refined by Nikolai Korotkoff, who added the use of a stethoscope to detect pulse rate, thereby enabling doctors to measure blood pressure while the heart was relaxed as well. Korotkoff suspected that both pressure readings were important, and today we realize that certain indications, such as a rise in the systolic with a stable or falling diastolic pressure, may suggest brain damage. The neoprene bulb is commonly made using vacuum-assisted injection molding. In this process, molten neoprene is injected into a mold of the proper shape. The mold is equipped with tiny holes, through which the air in the chamber is drawn out just before the neoprene enters. The resulting vacuum causes the neoprene to flow into the cavity evenly. Within a few seconds after injection, the neoprene cools and hardens and can be removed. The pressure gauge contains two phosphor-bronze disks soldered together. Some blood pressure monitors utilize either a mercury manometer or an electronic display. All blood pressure monitors feature an air pump device equipped with a control valve, a means of indicating pressure, a constricting band to be attached to the patient, and the various connecting hoses that operate the system. Although three distinct types of blood pressure monitors exist, they differ basically in their means of registering pressure: one type uses a pressure gauge or dial; another type uses a mercury manometer (a manometer is an instrument that measures the pressure of liquids and gases); and the third uses an electronic or digital display. Despite the availability of electronic display sphygmomanometers, instruments that use a manometer or a dial are still more popular because they are easier to service as well as accurate, durable, and inexpensive. This article will focus on the dial or pressure gauge type. A typical blood pressure monitor features a neoprene or rubber pump bulb that a medical technician squeezes to build air pressure in the system. Increasing air pressure inflates the constricting band and provides a pressure signal to the manometer or indicating gauge. The process is controlled by a valve, which has a hose fitting to attach the tube leading to the constricting band and gauge. Integral to the valve is a one-way flow device that operates only when the valve is closed. It usually consists of a small rubber disk or ball that is placed over the air passage from the squeeze bulb opening and secured by a screw or clip. The compressed air raises the ball slightly when the bulb is squeezed, sealing the opening to the atmosphere and forcing air to enter the cuff. Upon release of the bulb, the ball seals the opening between the bulb and the hose, opening the former to the atmosphere and allowing it to refill with air. This cycle is repeated until the correct starting pressure is reached. The manual valve opens a bypass route to release the air while readings are being taken. The rubber hoses are made by continuous extrusion, in which molten rubber is forced through a die block by a rotating screw device. Within the block is a rod the same size as the inside of the tubing; as the rubber flows around this rod and out of the die, it cools and assumes the shape of the tubing. It is then cut to the proper length. The dial, or aneroid type, instrument is a mechanical pressure gauge that has a pointer and dial calibrated in millimeters of mercury. The pressure gauge consists of three basic groups of parts: a pressure element and socket assembly; a movement and dial assembly; and a protective case and lens assembly enclosing them. The pressure element comprises two phosphor-bronze disks of approximately .010 inch (.025 centimeter) with a formed lip on the outer edge. The movement is usually made of polycarbonate and brass materials and contains a small gear train that amplifies the short travel distance of the disks. The movement assembly also supports the dial, which may be brass, aluminum, or plastic. The output shaft of the movement is mounted with the aluminum pointer. 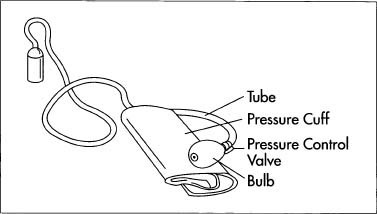 The squeeze bulb is usually rubber or neoprene, as are the connecting hoses. The band, or cuff, is basically a fabric-covered neoprene bladder with a hook and loop (Velcro) fastener. The bladder is enclosed in a nylon or synthetic fiber fabric, which protects it from cuts during use by on-scene rescue technicians and reduces patient discomfort. The band must be very flexible and durable to accommodate the infinite differences in patients and situations. The control valve can be made of polycarbonate, brass, stainless steel, or combinations of these materials. Many manufacturers purchase the components of the blood pressure monitor separately, then assemble and package the unit for sale. Each part has its own manufacturing and assembly process. 1 The bulb can be made using various processes, but it is most commonly produced using vacuum-assisted injection molding. Compressed air is used to blow the melted rubber or neoprene material into the cavity of a two-piece metal die set featuring the negative image of the bulb (the operation resembles blowing a gum bubble inside a bottle). The die also contains small holes through which air is drawn out just before the material is injected, helping it flow into the die cavity at a uniform thickness. While these holes are large enough to allow air to escape, they are too small to permit significant amounts of the rubber to seep out. The remnant of the rubber material that is drawn into the holes produces small protuberances that resemble the small "whiskers" visible on a new tire. Within a few seconds of its injection, the material has cooled so that the die may be opened, revealing the finished bulb. After a minimal amount of hand work to remove the whiskers, the bulb is ready to be attached to the other components. 2 The valves are made by die casting, plastic injection molding, and machining from bar material. They incorporate connection features that allow the bulb and hose to be attached. Machined valves can be made on a lathe controlled by a computer program that instructs it to turn the shape, threads, and other features. A finished blood pressure monitor. While monitors that use pressure gauges for pressure display will continue to be popular because of their portability, electronic displays will increase in use as new power sources are developed and the design is made more rugged. Mercury monitors will likely drop from favor because of the hazardous effects of mercury. 3 The gauge consists of further sub-assemblies, each of which contains machined, molded, and stamped parts. 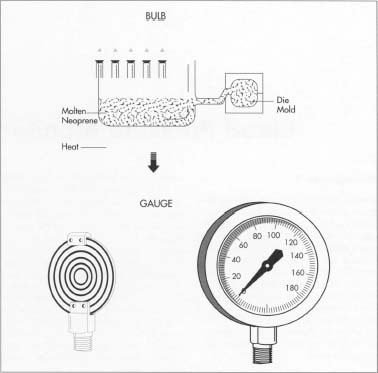 The most important component of the gauge is the pressure element. It is constructed by soldering two disks together at the formed lip to construct a hollow wafer. The pressure from the system is introduced into the wafer though a hole in the socket connection, which in turn is connected to the squeeze bulb and cuff. As the internal pressure increases, the wafer swells. It is this swelling that is detected by the movement assembly, causing the pointer to rotate about the dial. After assembly, the gauge must be calibrated. This is accomplished by connecting it to a pressure source with a master gauge of known accuracy. Slight adjustments are made in the movement linkage until the pointer of the gauge reflects the correct pressure readings. 4 The constricting cuff, or bladder, is made by heat sealing two rubber sheets together to form a flexible band. A tubing fitting is incorporated into this sealing process, providing a connection for the air supply. A fabric covering is then sewn to the bladder by conventional methods. 5 The hoses are made by continuous extrusion, a process in which pellets of rubber or similar material are heated to the melting point, at which they become clay-like and viscous. Within the same machine, a rotating screw device forces this molten material through a die block, which is simply a hole in an aluminum block the same size as the outside of the tubing. Secured within the block is a rod that is the same size as the inside of the tubing and positioned in the center of the hole. As the material flows around the rod and out the hole, it cools and assumes the shape of the tubing. At this point, it is cut to length and coiled onto spools for shipment to the assembly facility. 6 At final assembly, hoses are used to connect the components discussed above. The hoses are then checked for leaks and the calibration is verified. This is a good example of JIT (just-in-time) material requirements planning and TQC (total-quality-concept) management. Missing any one of the components, the entire assembly is useless. The plant must receive the parts and supplies in a timely manner to assure delivery of the finished product to the customer. The items must be of satisfactory quality, so they can be assembled correctly and without compromising the design. Many companies today have established quality management procedures. These procedures are simply intensive studies of all aspects of manufacture to eliminate or reduce the possibility of producing a defective part. It is not just making the part, but also designing it, selecting the materials, choosing packaging selection, and all other aspects that determine the quality of the finished product. Medical product manufacturers and their suppliers are prone to liability suit due to failure (or perceived failure) of their products. A portion of the cost of the instruments stems from the costs of insuring and defending the company against these lawsuits. Many companies have discontinued products because the liability risk is too much of a financial burden for them. For example, the mercury type instrument will probably be discontinued due to hazardous materials issues as discussed above. The electronic versions will most likely increase as new power source designs and improved ruggedness are achieved. Medical technicians and therapists rely on measurements of blood pressure as a benchmark for health, and consequently, some type of sphygmomanometer will always be used. Emergency Care and Transportation of the Sick and Injured. The American Academy of Orthopedic Surgeons. Sphygmomanometers: Electronic or Automated. Association for the Advancement of Medical Instrumentation, 1987. Travers, Bridget, ed. World of Invention. Gale Research, 1994. Calem, Robert E. "Monitoring Blood Pressure Without Skipping a Heartbeat," New York Times. March 28,1993, p. F16 (N).